The California Lemon Law (Song-Beverly Consumer Warranty Act) is a law designed to protect consumers who purchase warranted goods at retail in California. The Lemon Law applies to all consumer goods including, but not limited to – cars, trucks, vans, motor homes, RVs, motorcycles, appliances; etc. In order for the California Lemon Law to apply to a consumer good, the good must be covered by a warranty. If the consumer good is considered to be a lemon under the California Lemon Law, then the owner of the good is entitled to, among other things, a replacement good or reimbursement of the good’s purchase price. The Lemon Law applies to new and used consumer goods. The Lemon Law also applies to certain business use vehicles. Please browse this website for more information concerning the California Lemon Law, or feel free to contact David J. Farrell for a free consultation. David J. Farrell is a California Lemon Law attorney with more than 25 years of experience handling California Lemon Law cases. As a Lemon Law lawyer, David Farrell has personally handled over 2,000 cases, resulting in millions of dollars in recovery for his clients. David Farrell is an experienced trial attorney having tried several Lemon Law cases to verdict. David Farrell personally handles all aspects of his client’s cases and is always available to answer his client’s questions. He also personally consults with each potential client and personally reviews all documents prior to rendering an initial opinion. For most cases, David Farrell does not charge his clients attorneys fees and is willing to advance costs. The Law Offices of David J. Farrell takes various Lemon Law cases concerning new and used cars, trucks, vans, motorhomes, motorcycles and more. 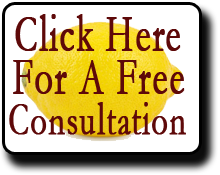 For a free consultation concerning the California Lemon Law, please contact David Farrell via phone toll free (866) 360-6886, his contact form or e-mail. The Law Offices of David J. Farrell maintains this website to provide general information concerning the California Lemon Law and the services offered by David Farrell. The information herein is not intended to provide legal advice for any specific factual situation. For an actual opinion concerning a particular factual situation and its applicability to the CA Lemon Law or other laws, one should contact David Farrell for a free consultation. David Farrell is licensed to practice law in the State of California. If you have a consumer good or vehicle that was purchased outside of California, you should consult an attorney from the state the consumer good or vehicle was purchased and/or serviced.